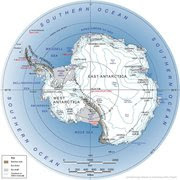 The South Pole: Solo but not Alone: One Month to go now.....Excitement is building! One Month to go now.....Excitement is building! In exactly one month, I am scheduled to start my solo ski to the South Pole. Sometimes I think this is a long way away, and other days it seems so close, almost to be scary. I'm currently based in Cape Town, where I am busy with my final mental and physical training, and attending to the last items on the equipment / expedition To Do lists. 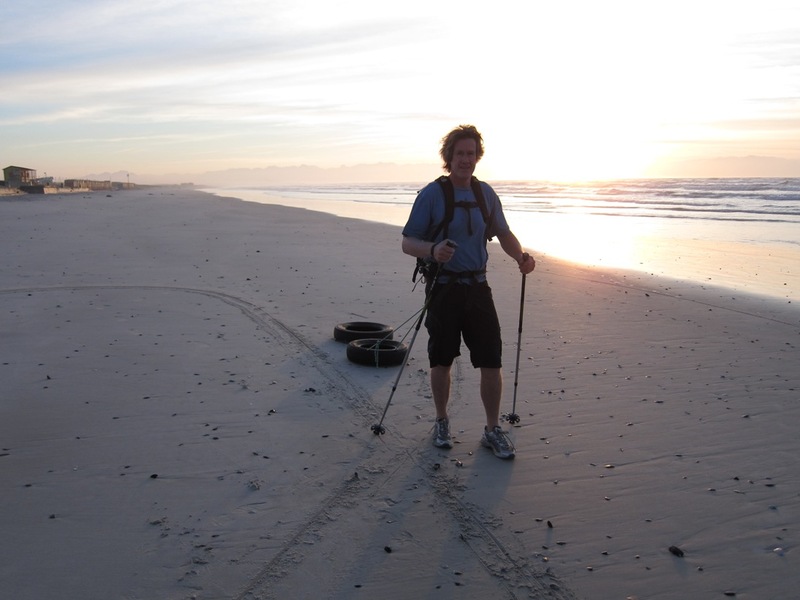 The training involves daily pulling of car tyres along the world renown surfing beach of Muizenberg, on the Indian Ocean side of Cape Point. 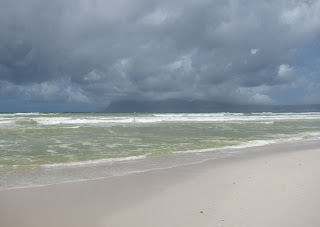 I used this same section of beach for my training for the North Pole. It stretches for more than 30 kilometers forming the northern shore of False Bay, which is notorious for its Great White Shark population. In getting to this point in my preparation my 5 weeks in New Zealand were invaluable, in developing my technical ski-ing skills, building the stamina for the long ski day that lie ahead, and then developing my newly acquired kiting ski-ing skills. This was all done in the wonderful New Zealand Alps environment of Snowfarm lodge (http://www.snowfarmlodge.com/) not far from the quaint town of Wanaka on the South Island. The lodge was my home for the 5 weeks, and I have to thanks Steve Gould, the manager, and his assistant Cassie, for making me feel like very at home, for the duration of my stay. Snowfarm becomes training ground for the worlds Olympic cross country skiers during the northern hemisphere summer, and I remember my first venture out onto the groomed ski trails, and feeling so inadequate as I clumsily stumbled around the courses, with these super athletes whizzing passed me, clearly using a technique that was not only faster than mine, but requiring of much less energy. I have to admit that the first day I was quite demoralised, but then told myself that one of the reasons I was there, was to learn how to cross country ski properly, and so immediately signed up for a lesson. Well, with a huge learning gap to be closed, I needed the best instructor, and was pointed in the direction of Alexi, a former Russian national cross country competitor. The lesson started off disastrously as my preconceived ideas of how it should be done, were challenged at every step, but 5 weeks later the transformation had been successfully completed. This largely thanks to Alexei Sotskov, in his practical and animated style, where he emulates one's style, making it so obvious how 'stupid' one looks, and then proceeds to show one what it should look like, provides the clear vision of the gap one needs to close. A week before my departure, the ski traffic had slowed down significantly, and it was time for Alexei, and many of the other instructors to head back to their homes scattered all over the planet. I wanted one closure lesson with Alexei, and this just gave me the confirmation I wanted to hear: He was amazed at the progress I had made, and admitted to me that in that first lesson he had serious doubts as to whether I would be able to close the skills gap I had to close. With all the sincerity of a teacher who was both proud of his pupil and his training skills, he pronounced me the most improved skier of the season! This was the final vote of confidence I needed to know I was now really ready for the 900 kilometer ski to the Pole. Not that I was planning to use these skills to compete on the cross country ski race circuits of the world... Rather these skills will enable me to pull my sled more efficiently over the cross country like ice terrain of Antarctica and at a faster speed that I would have previously. In the thirty five or so days that the 900 kilometers would take me, these benefits will add up to be enormous. Turning now to my Kite ski-ing training, many may ask where kite ski-ing fits into my Solo but Not Alone trip to the South Pole? 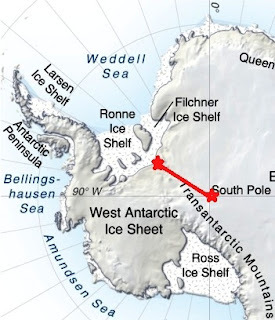 I am plan to meet my kite ski-ing team mates at the South Pole, and then we will kite back towing our sleds with all our food and gear planning to arrive back at the base camp at Union Glacier, some 1100 kilometres away, and close to where my solo trip would have started. We expect this trip will take somewhere between 14 and 20 days depending on the winds. Our team is being guided by Richard Weber who lead my expedition to the North Pole in 2010. This team experience will be a diametrically opposite experience to the solo one to the Pole, and I am really look forward to embracing the fullness and diversity of these unique and very special expeditions. Neither is better than the other, they are just so different, and I love seeing the perspective of the difference and feel privileged that I can relish both intense experiences on one expedition. I'll put up a separate post on the specifics of the kite ski-ing, but suffice to say here, the time in New Zealand enabled me to transform my water based kite surfing skills to the snow and ice environment, but this was not without a few knocks and bruises along the way, and a lot of help from Tim Stockman, of Kitesports in Christchurch who put togetehr the wonderful "Wanakite" kite ski-ing week. Kiting in the mountains brought with it gusty conditions which challenged the beginner who had kites more suited for the smoother winds of Antarctica. In hindsight this has proved to be good training, however I am still a bit apprehensive that I haven't experienced kiting with a sled along endless miles of flat ice surface that we will face in Antarctica. I was fortunate to have Michael Archer, one of my Antarctica kite ski-ing team mates who is based in New Zealand, join me for a few days at Snowfarm. This provided great opportunity to get to know each other, discuss equipment and to do some kite ski-ing learning together. Prior to my departure for Antarctica 0n 16th November, I'll be updating this blog with posts that should be of general interest taking you into my expedition preparation world covering my physical and mental state, equipment issues, a bit of history and background to my route and the continent of Antarctica, and hope this helps everyone feel like they are on the journey to the start with me!